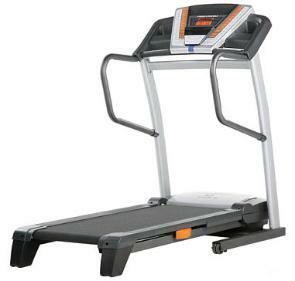 The ProForm 980 Audio trainer is a mid-priced treadmill in the line-up of Icon’s budget models. Icon Fitness sells ten of thousands of treadmills every year, making them the number one retailer in treadmills. The ProForm 980 Audio comes with a lot of great features for those of you who don’t mind spending a little extra for an upgrade. The price of this trainer is very attractive for what you get. The ProForm 980 Audio trainer has a bright ClearView™ backlit console to display your workout stats. It comes with pre-programmed iFit® workouts, designed by certified personal trainers, which help you focus on weight loss, aerobic fitness, and performance goals. With these unique programs you can lose weight and look great in as little as 8 weeks! UPDATE: The ProForm 980 treadmill is no longer available. To find a comparable machine check out the new full lineup from ProForm on the company site to see which model appeals to you. The ProForm 980 replaces the iSeries 785E (they’re identical), which was also a fine machine. Proform is still using a decent 2.25 CHP motor on these trainers, which is strong enough to maintain power for long sessions of light to moderately intense use (i.e., walking and light running). Experts who have done reviews on the ProForm 980 Audio trainer feel it offers good reliability, cushioning, features, stability, and power. The parts/labor warranty is weak so you should consider purchasing an extended warranty on this machine. Consumers are benefiting from the cut-throat competition and technology advancements in the sub-$1000 treadmill market. These ‘trainers’ have better motors, circuit boards, and components than treadmills that sold for $500-$1000 just 10 years ago. 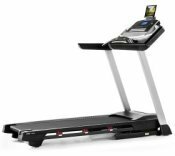 Because of this improved engineering, which includes one-touch power inclines and adjustable cushioning, as well as software innovations such as the iFit® Workout Cards, modern treadmills under $1000 are an exceptional value. If this model is within your budget, it’s definitely worth a look. At $749 (MSRP $1299), the ProForm 980 Audio trainer comes with more features than the basic model, the 680 trainer. It has a stronger motor, a folding SpaceSaver design, a workout fan on the console, the iFit® card technology, handgrip HR monitors, a larger user capacity, and adjustable cushioning. We like both of them. Take a few minutes to compare the features on both of these attractive trainers and see which one is right for you.